This is going to sound corny, but let's assume that after basic needs are met, what we really want is love. Social scientists can dress up the word love as "social status" or what have you, but what status gets us in the end is love. Why am I harping on about love? Well, somebody has to. Meanwhile, the way that our society is structured, the place where we get and give our love is within our relationships with corporations. 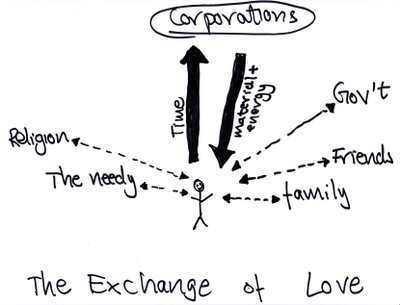 Corporations give us love in the form of energy and stuff (and status). We give them love in the form of time (sometimes represented as money). We talk a lot about weakening the bond with the corporations--consuming less, working less. Get less stuff. 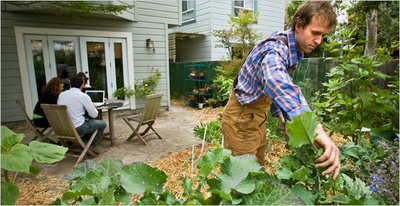 More sustainable life. The problem is, where does the exchange of love now come from? From strengthening the bonds that are made so weak by the strength of the corporate bond. If we strengthened those other bonds, is it possible that we'd automatically find ourselves less inclined to service the stuff for time exchange? 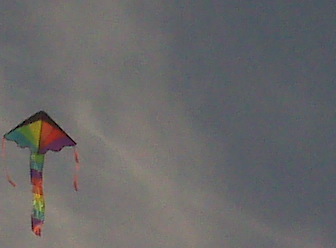 A couple of days back, I posted a couple of pictures--one of a big TV and one of my little girl flying a kite. I posed a question. Which is more life fulfilling, the time spent working to pay for and watching the TV or the time spent in the less resource-intensive activity with my daughter? I posit, you see, that human happiness need not be resource intensive. In fact, if we change our lifestyles in a way that protects the habitat we depend on, we may well find that our quality of life is better. So today, Isabella and I went to the same park to fly our kite and a state parks officer came and told us flying kites was illegal. 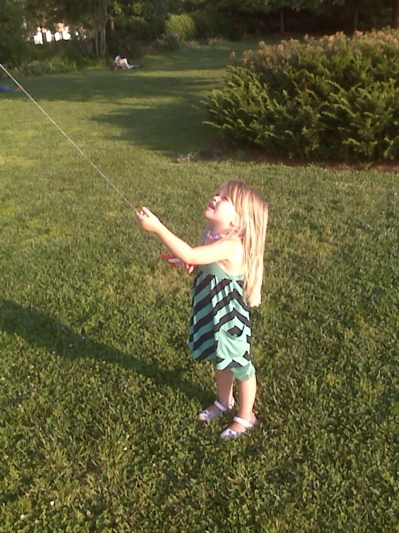 God bless, three-year-old Isabella, because she walked straight up to the officer's vehicle and said, "But if I can't fly my kite I will be very sad." Going home to watch a TV, on the other hand, apparently poses no legal threats. Meanwhile, last Friday night, here in New York City, a group of cyclists from Times Up! rode on their monthly protest to reclaim the urban landscape from the automobile. In Times Square, as the bikers rode through, a police officer deliberately ran into a cyclist, violently body-checked him to the ground, and then arrested the cyclist for assault (see a video recording the event below and read more here and here). Whether you're choosing to fly a kite instead of eating McDonalds in front of the TV or protesting bad air in the city by riding your bike, there are huge institutional obstacles to environmental change. 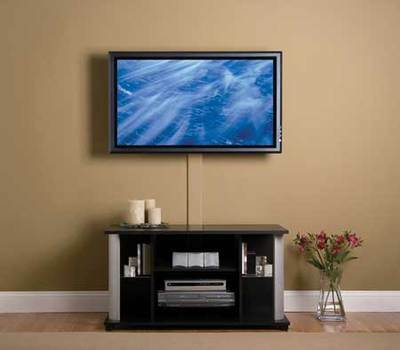 They are of a type that is more invidious than, say, the fact that companies use too much packaging. I mention this just because I think it's important to acknowledge. Because it's part of the challenge. And because it makes me incredibly sad. One definition of economics is the study of the choices of individual and groups of humans make when faced with the fact of limited resources but unlimited needs and wants. At the heart of neoclassical economics is the "rational actor" model of human behavior. That is, according to the model, individuals, groups and nations will consider the available options and then pick the one that maximizes benefit to them. It's kind of a sad, uninspired model, if you think about it, because it assumes that people are more selfish than compassionate and more self-interested than creative. It is also the model around which the entire mainstream political debate for climate change solutions is based (I'm not including, here, the do-nothing or do-little antagonists like Senator James Inhofe). To wit, in case you haven't been following, both sides of the mainstream climate change solutions debate predicate their arguments on the assumption that people and institutions will not moderate their use of fossil fuels unless efficiency measures and renewable energy become cheaper. In other words, according to the rational actor model, unless the change in behavior maximizes the benefit to them. One side of the debate believes, in simplistic terms, in making efficiency and renewables attractive by raising the cost of fossil fuels (these are the cap-and-traders, the Joe Romm types). On the other side of the debate are those who think we should do it by lowering the cost of renewables (the invest in energy tech advocates, like Shellenberger and Nordhaus). Because both of these approaches are based on "rational actor"-based economic theory, neither allows for the possibility that people might, say, be inspired to do the right thing for the sake of themselves and posterity or, say, because a less energy-intense lifestyle might have the potential for better quality of life. Based on the neoclassical economic theory, in other words, the prevailing political solutions hold that if it's easier on people's pocketbooks to save the planet, they'll save it. If it turns out to be more expensive, we're doomed. Few other considerations apply. Now, I'm not saying that there isn't some truth to the pocketbook theory. There is, but it's not the whole truth. This is why I go on about how a happier planet will make for happier people. There are more than dollars-and-cents motivations for changing. While planetary well-being may not mean we'll all be richer, it may mean that we can find a way to be happier and have better quality of life overall (look here and here, for example). The problem is that such subtle motivations are hard to contain in neoclassical economic theory. That, in turn, may mean that our leaders, who depend on economists, don't have all the policy tools they need to enact climate change solutions. Which leads me after a long-winded introduction to the nascent field of behavioral economics, which seeks to answer the same questions of how humans will act in the face of limited resources and unlimited needs, but does not hold to heart the rational actor model. Instead, behavioral economics seeks to study empirically how people and their institutions actually behave and to apply this knowledge to predictions. In other words, it seeks to provide our officials with more robust policy tools (you can read New Yorker writer Elizabeth Kolbert's excellent review of a behavioral economics book here). "The current crisis of sustainability cannot be resolved within the confines of the system that generated it. For economic analysis this means stepping outside the Walrasian system with its emphasis on one part of human nature (greed and egoism) to the neglect of other the facets of human nature (cooperation, altruism)." "Increasing consumption does not translate into increasing social well-being... The drastic reduction in fossil fuel use required to stabilize the climate will certainly mean a reduction in the production of consumer goods... A number of economists call for a re-orientation of welfare policy goals from “income” to “well-being."" "Absolute income may not be correlated with well-being but relative income is... Relative losers in consumption reduction should be compensated in some way to minimize the relative income loss. The wealthy for example, could be rewarded with some sort of public recognition of their sacrifice for the common good. People are more inclined to give to public goods when they can be observed to do so and this should be incorporated into climate change policy." "“Development” in the third world need not follow the path of the industrialized nation during the twentieth century... Nussbaum (2000, chapter 4 and website of Human Development and Capabilities Association) has gone even further in calling for “distributive justice” creating the conditions for the realization of a set of central human capabilities... With a focus on individual happiness and self-actualization, the developing world could improve its position relative to the North without emulating the consumption frenzy that drove past economic growth." The politicians and so many others worry that using fewer planetary resources means deprivation and that deprivation won't sell. But they're lacking the vision of something better. I can't help thinking this treadmill we're on means we're already deprived. The message is that in saving the planet we could have more--not more stuff but more life. Because great lives need not cost the earth. 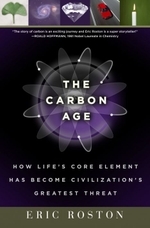 There are a few reasons why a No Impact reader might care a whole lot about the fact that a writer named Eric Roston has just published his excellent book The Carbon Age. One reason might be that, with so much talk about carbon dioxide this and carbon dioxide that, no one, until now, has given us a volume that really explains the science of carbon itself. Carbon is both the the atom at the center of our DNA--of life--and of almost all of the human-activity-related global warming gases. The carbon dioxide, methane, and halocarbon molecules are all based on carbon. Another reason might be because Eric reported for Time on climate and energy issues for six years. Yet another might be because he is a senior fellow at the Nicholas Institute for Environmental Policy Solutions at Duke University. But my own personal reason is because he has become a friend. First as a frequent commenter here on the No Impact blog. Then by telephone (he's helped me more than once to understand the various climate solutions rattling around Washington). And finally, tonight, we met because he's here in New York on his book tour. The geological time span that dates from 359 to 299 million years ago is called the Carboniferous Period. They call it that because the Earth saw a catastrophic drop in the partial pressure atmospheric carbon (dioxide) -- a 90% drop. Here's part of the story, and as global carbon cycle scientists tell it, not even the most important part. In this period, woody plants populated bogs around the Earth's then-supercontinent. They lived their leafy lives, collapsed, perhaps one into another, face-planted in the muck, and over a couple of hundred million years became coal. So, by extracting coal and burning it into atmospheric gas, we are reversing the photosynthesis that first captured solar energy (and atmospheric carbon) in living tissue 350 million years ago, in the Carboniferous. Except, we are doing it several orders of magnitude faster than it took to bury all that carbon to begin with. Big problem, by the way, if you are used to the stable climates in places humans have built settlements and cities for the past 10,000 years. (Oil and gas are more "recent" geological phenomena. Most of the oil came "only" in the last 70 million years or so.) On the face of it, it's not illogical that atmospheric composition should change dramatically and acutely if you decided to pack it with 100 million years' worth of gasified sediment. You can listen to the NPR All Things Considered review here. Visit Eric's site here. Meet Trevor Paque. He's landscape gardener meets local food farmer. He rents himself to homeowners, but instead of planting and growing pretty flowers for them--and using the requisite water and chemicals--he grows them organic produce and leaves it in a box on their back porch. This apropos, partly, of yesterday's post about innovation vs conservation. It seems to me--and I get that this service is rarefied and elite--that is this the kind of innovative thinking we need from business in general? A way to improve people's lives while helping the planet? A way to make helping the planet seem cool and trendy? A way to make money doing it? The point is there are opportunities and jobs to be had that assist the healing of the planetary habitat we depend upon for our health, happiness and security. Pitting economic well-being against the environment is just plain wrong. PS I know, we shouldn't have to make helping the planet it cool and trendy, but it's all hands on deck, no? Besides, isn't this the quintessence of "green business?" PPS Meanwhile, while Trevor helps the rich to grow local food, the excellent NYC organization Just Food helps neighborhoods grow good fresh, produce to which they might not otherwise have access. Check them out! There were seven stages to the No Impact project: no trash, no carbon-producing transportation, sustainable eating, no buying anything new, no fossil-fueled electricity, careful water use and giving back. The first six stages were all about conservation. About limiting. About doing less harm. There were incredibly discoveries to be made about the truth of where joy and the wonder of life come from, and it isn't, after a certain level, from resource use. But the final stage was to me the most important. In the giving back stage, I volunteered with environmental organizations. I helped experiment with putting oysters in the New York harbor to clean it up. I helped care for newly planted trees that would take diesel particulates out of the city air. The final stage was not about conservation. It was about innovation. And it was in this stage that I met new people and made the most friends. It was here that the people were most excited. It was not about doing less harm. It was about doing more good. It was less about limits and more about possibility. It was, in fact, the part of the project where I may have learned the most about people. Because I learned about what inspires them. Conservation means taking care of the old. Innovation means bringing in the new. Don't get me wrong. I believe in energy and resource efficiency. I believe in the low-hanging fruit. But I also think it's important to remember that the amount by which I can do less harm is limited by the harm I do. The potential amount of good I can do, on the other hand, is limited only by my vision and imagination. 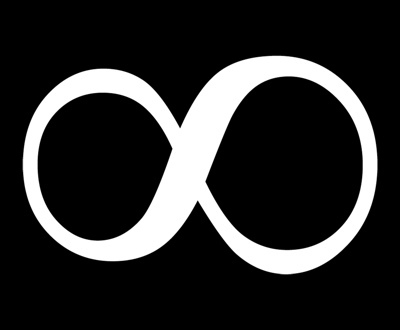 It's infinite. PS Thank everyone for their thoughts yesterday. I'm going to filter through and make a post out of them. The first step on the personal path to green? Just wondering, if a friend decided they wanted to do something about the environment, how would you tell him or her to start? What's the way in? What's the most important first step? Al Gore Thursday made an important speech in which he called upon the United States to generate 100% of its electricity by renewable means by 2018. This is exactly the approach we need to achieve what is scientifically necessary. I haven't spoken to them yet, but I believe it is entirely in line with the calls of 1Sky.org and 350.org, the climate change organizations whose policies I support. "Our dangerous over-reliance on carbon-based fuels is at the core of all three of these challenges -- the economic, environmental and national security crises." "Today I challenge our nation to commit to producing 100 percent of our electricity from renewable energy and truly clean carbon-free sources within 10 years." "The sharp cost reductions now beginning to take place in solar, wind, and geothermal power -- coupled with the recent dramatic price increases for oil and coal -- have radically changed the economics of energy." "To those who say the costs are still too high: I ask them to consider whether the costs of oil and coal will ever stop increasing if we keep relying on quickly depleting energy sources to feed a rapidly growing demand all around the world. When demand for oil and coal increases, their price goes up. When demand for solar cells increases, the price often comes down." "America's transition to renewable energy sources must also include adequate provisions to assist those Americans who would unfairly face hardship. For example, we must recognize those who have toiled in dangerous conditions to bring us our present energy supply. We should guarantee good jobs in the fresh air and sunshine for any coal miner displaced by impacts on the coal industry. Every single one of them." "Of course, we could and should speed up this transition by insisting that the price of carbon-based energy include the costs of the environmental damage it causes. I have long supported a sharp reduction in payroll taxes with the difference made up in CO2 taxes. We should tax what we burn, not what we earn." "In order to foster international cooperation, it is also essential that the United States rejoin the global community and lead efforts to secure an international treaty at Copenhagen in December of next year that includes a cap on CO2 emissions and a global partnership that recognizes the necessity of addressing the threats of extreme poverty and disease as part of the world's agenda for solving the climate crisis." "There actually is one extremely effective way to bring the costs of driving a car way down within a few short years. The way to bring gas prices down is to end our dependence on oil and use the renewable sources that can give us the equivalent of $1 per gallon gasoline [by converting to electric cars]." "Our families cannot stand 10 more years of gas price increases. Our workers cannot stand 10 more years of job losses and outsourcing of factories. Our economy cannot stand 10 more years of sending $2 billion every 24 hours to foreign countries for oil. And our soldiers and their families cannot take another 10 years of repeated troop deployments to dangerous regions that just happen to have large oil supplies."